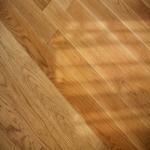 Oak timber flooring is nearly one of most widely used flooring material in the world for centuries.Oak wood has been processed with a wide range of different styles ,such as natural smooth oak flooring,handscraped oak flooring,distressed oak flooring,oak industrial flooring,oak parquet block,wire brushed oak flooring etc.Not only in solid but also in engineered types, oak are so widely used than any other solid hardwood species. 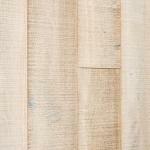 Genuine Oak is called Quercus alba L in botanical species,while the regions planted or grows from east Europe,Mediterranean Areas, Russia to Northern China. It is so widely spread except in Australia,Southeast Asia tropical areas or in South America. Generally oak is divided with Red Oak & White oak while Red oak is the main timber species in North America Areas,like US & Canada.The other so called oak wood like Brazilian oak,Chinese Oak,African Oak are not genuine oak which is not in same genus from Europe, Russia, North China or US regions. 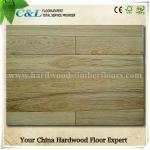 Currently Europe & Russia are the still the biggest regions exporting oak wood and most of solid oak timber flooring Acacia flooring material manufactured in China are imported from Europe or Russia . 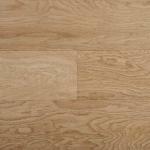 Hardwood solid oak flooring cost raised again and again due to the raw material supply shortage from countries in East Europe & Russia. 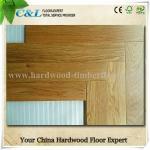 Timber flooring made of oak is always in excellent quality due to the natural stability and termite resistance.On the other hand ,smoke oak timber flooring or carbonized hardwood oak floors are even more durable than natural varnished oak flooring, 25years residential warranties & life time structure warranty can be reached if the oak timber flooring under regular maintenance. 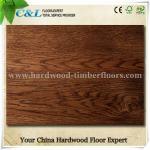 C&L hardwood use premier grade oak timber imported from Russia processing in our factory .The Premier Grade Oak wood is a guarantee of more uniform in color variations, little flaws,cracking or knots are seen on the finished surface.C&L hardwood supply also AB/ABC Grade oak hardwood flooring to customer's requirements. 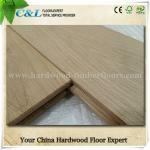 C&L Hardwood mill oak wood floor board with four side Tongue & Groove Joint,board to board fit perfectly to each other,very easy to installation.Each board is with slightly 45°Micro-beveled Edge,which makes the the floor more soft & elegant. Normally oak raw wood is properly dried under a MC of 12% in order to produce a qualified oak hardwood timber floor.C&L hardwood factory present a report as a proof that each batch of our solid timber floor kept with moisture content in the range of 10%-12%. 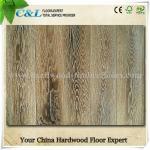 Solid oak flooring from C&L hardwood is sealed by primer pu finish on six sides on floor board , it enhances the dampness resistance to garantee the board stability after long time use. Surface coating is applied by 8 layers primer finish,4 layers top finish.The top finish we use German treffert aluminum oxide UV coating which greatly enhanced the scratch resistance of the timber flooring. 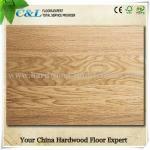 C&L hardwood oak solid flooring has a warranty of 25years structural under proper maintenance. 7 years surface UV coating wear though warranties plus 5 times more sanding and refinish warranty.